Taleggio. The stinky, milky, creamy, beefy, cheese of footy aroma that comes to us from northern Italy. 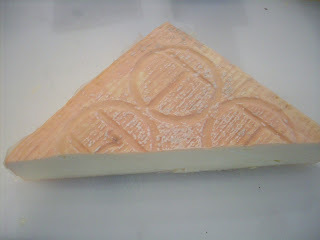 I've had Taleggio when it's young and it has a really creamy milky flavor to it. I've also had it when it is just perfectly ripe and has some beefy qualities, and an almost olivey fruitiness to it. I've also tasted it when it was verrrrrrrrry ripe. Although the taste was nice (kind of like dry aged beef and warm milk) the smell.......oh sweet mother of cheese......the smell was......hard to describe, but I'll give it a shot. So imagine if you will the Bulls locker room at the end of game 7 of the series, that went into double overtime, and then they lost anyway so you have that smell of sadness and despair, and then all their jerseys go into one laundry bag. It kind of smelled like that laundry bag. And dirty socks. Tasty though. I first met Taleggio when I worked at a northern Italian restaurant in Virginia. I used the cheese for sauce, cheese plates and for putting into my tummy. This cheese is delicious! It's also a super great melting cheese. Grilled cheese? No problem. Mac n' cheese? Absolutely. Cheeseburgers (last night's dinner). Heck yes! This cheese can do it all. This is one of my all time favorite cheeses. 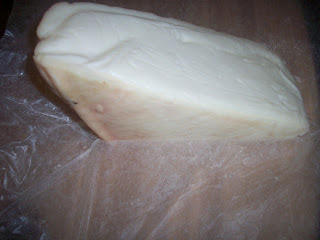 When I can't figure out what to pick up at the shop, I know that a chunk of Taleggio is always going to be a good thing. Does Martha own that saying or am I allowed to use it? Today at the shop I had cause to open one up and I realized that this is an interestingly shaped cheese for a two reasons. How do you know that you've got Taleggio and not some Taleggio wannabee impostor that tastes like ick and smells like plastic? Ok, well if it tastes like ick and smells like plastic, it's not the real ting. But if your cheese isn't branded like cattle, it's not the real thing. No, I don't know what the brands stand for. In my mind it's Taleggio, Taleggio, Taleggio Hey! I'll look into it though. Promise. Once cut in half from corner to corner, the cheese is then portioned for each customer. Going from the center of the cut side we cut off wedges. 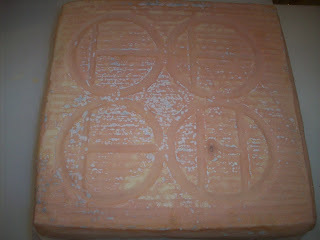 Doing it this way insures that each customer is getting the same amount of rind and paste ratio with each portion. I haven't decided if this wedge is going to be pizza, or mac n' cheese. All I know is I'm off today, and this cheese is going in my tummy.